The pictures show preliminary result for virtual Schlieren visualization of a shock wave (bright line) and a rarefaction fan (dark region). 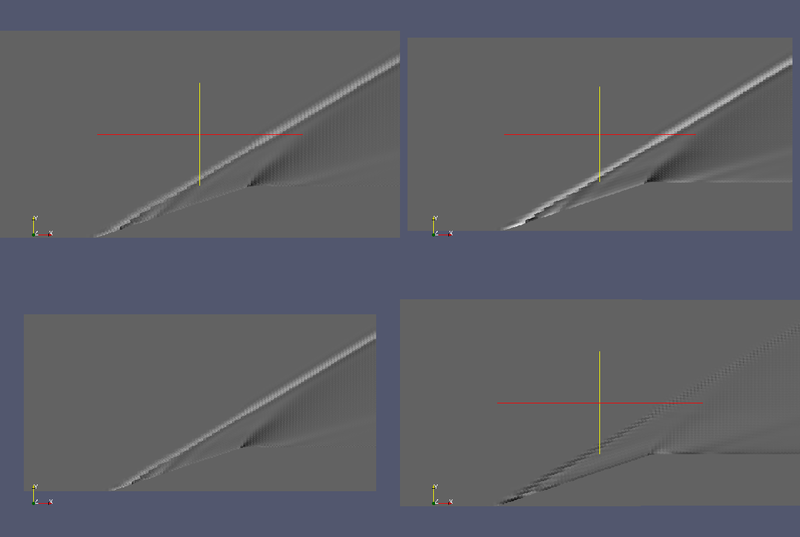 Top left picture shows the result obtained with a knife angle of 90 deg, a knife angle of 45 deg produces result shown in top right figure while in the bottom row are presented respectively a knife angle of 0 deg and an angle of 31 deg. This latter value is the one corresponding to the shock-wave slope, so thath's why the shock is badly highlighted! Tthe flow field was computed using SU2! We're currently working on CUDA implementation, results will be available soon!